The new Aeromotive Fuel Log incorporates features never before available for the sportsman racer. Each carburetor inlet features a ball and socket assembly that swivels 20 degrees allowing additional clearance for throttle stops, throttle linkage and other accessories. The telescoping log will fit 4150, 4500 Dominator (14201) and Demon (14202) carburetors. 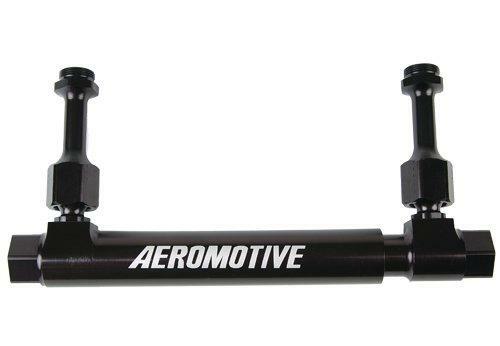 The AN-10 inlet and outlet ports will feed the hungriest big blocks, and adapt easily to Aeromotive P/N 13212 (Gasoline) or P/N 13214 (Double-adjustable belt drive alcohol) fuel pressure regulators. The type II bright dip black anodized finish provides durability and great looks, while dual 1/8” NPT ports provide access for gauges or pressure transducers.